Photoshop is a huge, multipurpose program. 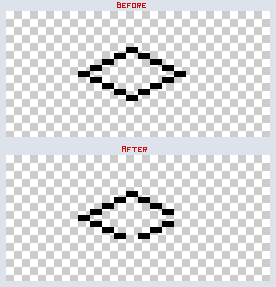 Because of this, some of the features that can be very helpful for pixel art are somewhat hidden, and not well known. I will try to highlight some of these features in a series of blog posts. 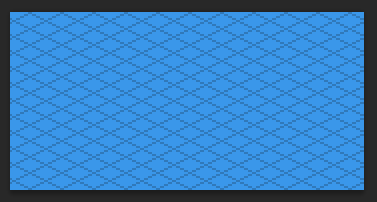 Isometric grids can be very helpful for creating isometric pixel art. They will help you draw straight lines and keep your objects aligned. Here I will teach you how to create your own. 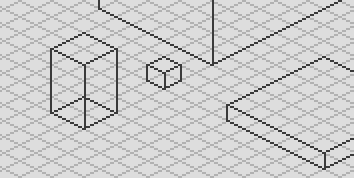 Below is an example I drew up in just a few minutes using an isometric grid I created. After you’ve got a square you like, erase the 2 pixels on the far right, and then again on the bottom. This is so it will tile correctly. Example below. Now from Image menu, select Trim. In the box that pops up, under Based On select Transparent Pixels, and make sure all four check boxes are checked at the bottom. Hit okay, and your document should now look like the picture below. Next, go back to the menu and click Edit, and select Define Pattern. 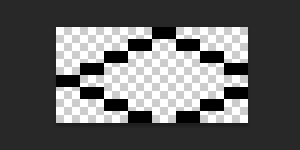 Enter a name for the pattern in the box that pops up (such as “Isometric Grid”), and hit okay. Now you have a pattern! When you’re ready to use it, create a new layer in the document you’re working on. Select the Paint Bucket Tool, and on the under the menu bar should be some options. One should be a drop down that says Foreground. Change that to Pattern. Now directly right of it, click the Pattern Picker, and select your newly created pattern from the list. 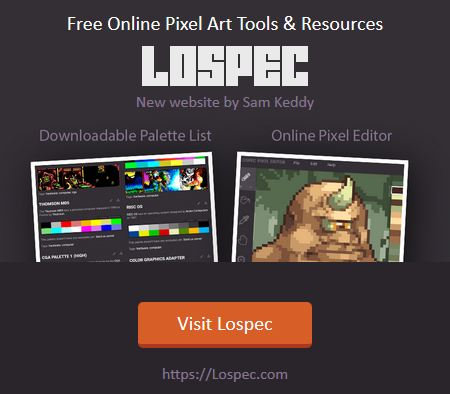 Now you’re ready to make your own pixel art blueprints! I suggest lowering the opacity of the layer to make it less obtrusive. It can go on top of, or below your work (or moved around). And remember you can make multiple sizes for different piece, it would be very nice to have a whole selection ready for when you need it. Thank you! I’ve been having trouble with this.